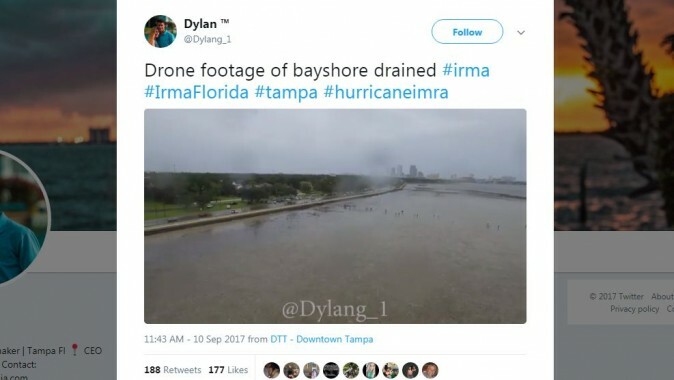 Shortly after Tampa Bay’s water was sucked up by Hurricane Irma, a drone operator captured people walking in the bay—a pretty dangerous move. Officials on Sunday warned people to stay away. 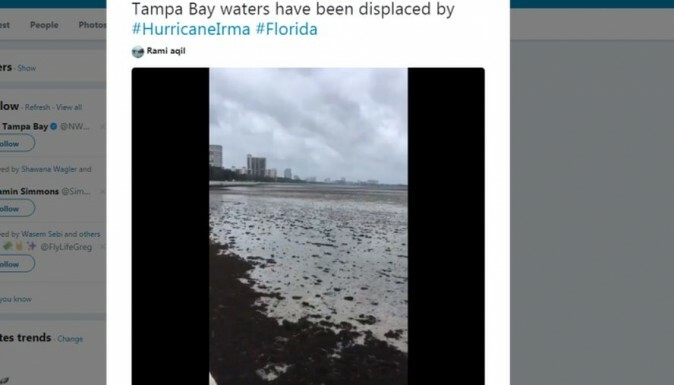 Earlier on Sunday, there were reports and videos posted to social media showing Tampa Bay’s waters being pushed out of the harbor, leaving puddles, sludge, and some muddy land. 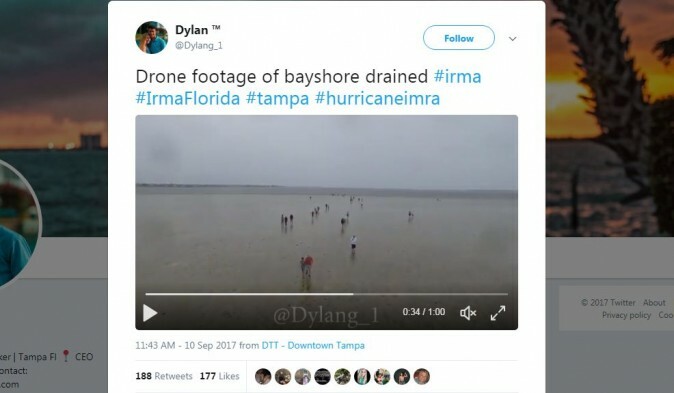 “The worrisome part will be later when the winds start pushing the water back,” Fox News senior meteorologist Janice Dean was quoted as saying, indicating that people who are walking out in Tampa Bay should be wary of doing so. “ALERT: Water surrounding Tampa Bay is very low due to the storm. It is dangerous to be walking out there,” Alert Tampa—the City of Tampa from the Office of Emergency Management’s Twitter account—posted Sunday. Officials have warned that a storm surge could reach 3 to 8 feet around Tampa. 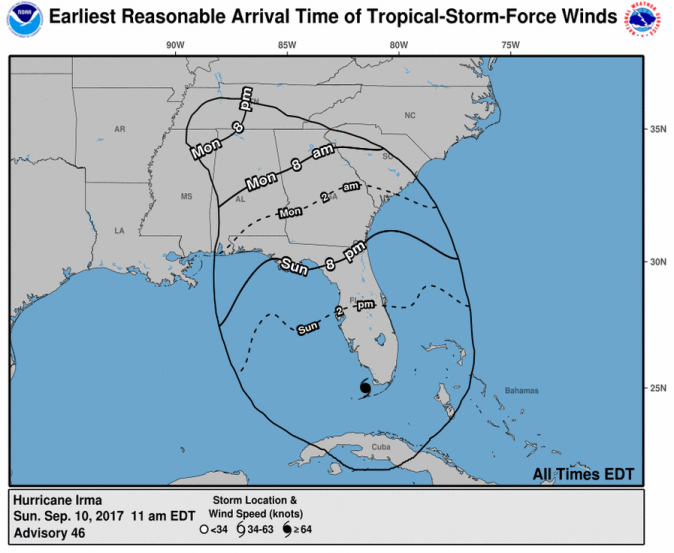 Hurricane Irma is predicted to hit Tampa Bay, St. Petersburg, Sarasota, and outlying areas on Sunday evening. Currently, the Category 3 storm is slamming Naples, Marco Island, and outlying areas. Tampa Mayor Bob Buckhorn declared a curfew for Tampa that is effective as of 6 p.m. Sunday, which means “all residents need to be indoors,” Alert Tampa said. It’s not the first time Irma sucked up water. 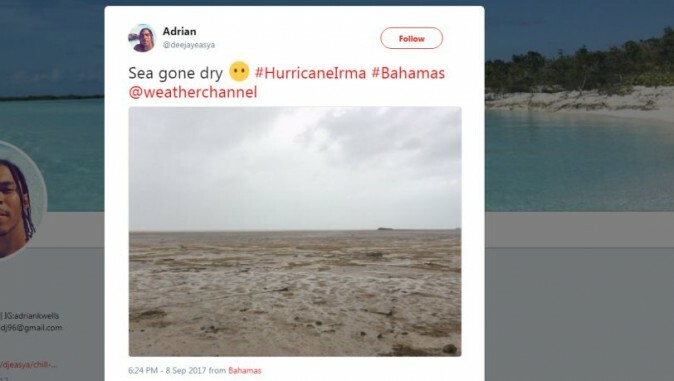 On Saturday, a person spotted the same phenomenon in the Bahamas, showing the ocean floor totally exposed.